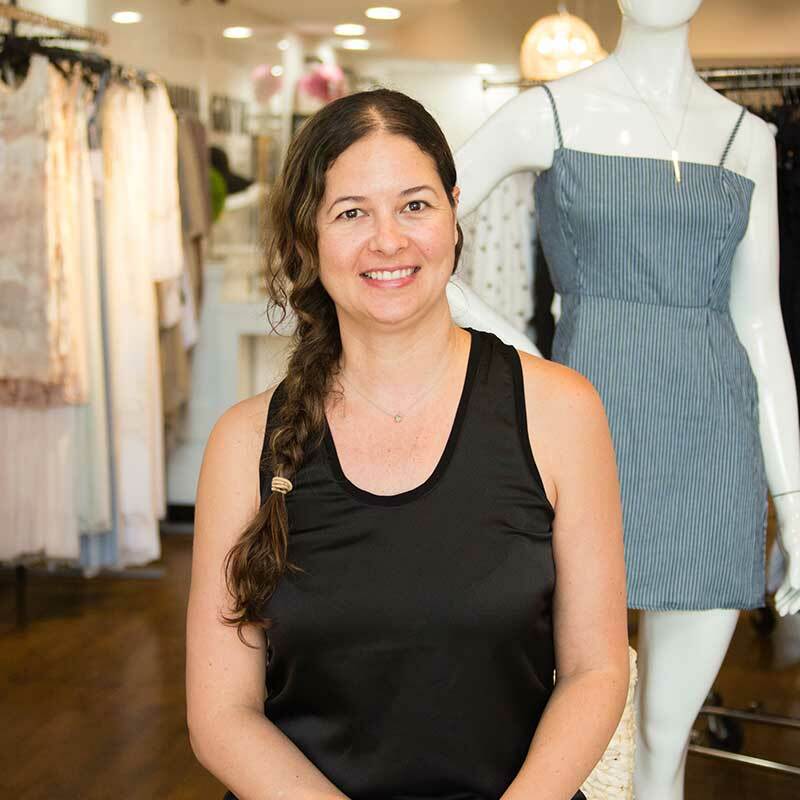 As the owner of Donna Gatta Boutique at Destin Commons, Marangoni shares her heritage through clothes. It’s safe to say that most of us don’t have the career we imagined for ourselves in elementary school. Children who dressed up in spacesuits likely never left Earth, and that Barbie karaoke machine probably didn’t pave the way to pop stardom. But, there are always exceptions. One is Michela Marangoni, owner of Donna Gatta Boutique at Destin Commons. Born and raised in Brazil, Marangoni recalls one day, at age 6, when she decided to take every piece of clothing from her closet and tape them all to the walls. As with most childhood dreams, practicality trumped idealism, and Marangoni wound up in the dental industry in San Francisco about 15 years ago. The Bay area was nice for a while, but Marangoni began to long for the sultry, summery weather that lingers year-round in tropical Brazil. She found a bit of Copacabana on the Emerald Coast. Living in Destin the past five years, she thanks the little slice of paradise for rekindling the aspirations of her inner fashionista. Marangoni began studying fashion at the University of West Florida. While she picked up some tricks of the trade from her courses, she said nothing could have prepared her for being a first-time buyer at a major trade show. “It was overwhelming!” Marangoni laughed, recalling when she and about 85,000 other retailers attended the MAGIC trade show in Las Vegas last August. Photo courtesy of Jacqueline Ward. Marangoni enjoys reflecting various cultures in her boutique’s version of tropical fashion. Along with domestic brands, her garments and accessories are imported from India, Spain and elsewhere. Marangoni’s store reflects her luxe-yet-relaxed fashion sense. For Marangoni, an Italian label called Scandal perfectly expresses her essence. The line’s flouncy fabrics include cotton, linen and silk and the garments’ pastel hues invoke visions of sand and surf. Marangoni and her exotic accent aren’t the only things with international appeal at Donna Gatta. Customers find a range of imported choices from an embroidered, Indian maxi dress to a sleek, sheer blouse from Spain. Marangoni likes to add other cultures’ sense of “beach chic” to our own coastal market. As an animal lover, Marangoni also advocates “vegan” clothing and purses, a trend she’d like to see take off. Vegan apparel is manufactured only with plant fabrics. She picked up vegetarianism in San Francisco, but she’s not a purist— sometimes Gulf seafood and a traditional Brazilian barbecue get the best of her. Donna Gatta Boutique also features a section of crocheted clothing handmade by Marangoni’s friend and a display of fanciful, floppy hats and eclectic jewelry. As she ultimately did, Marangoni advises others to follow your heart.